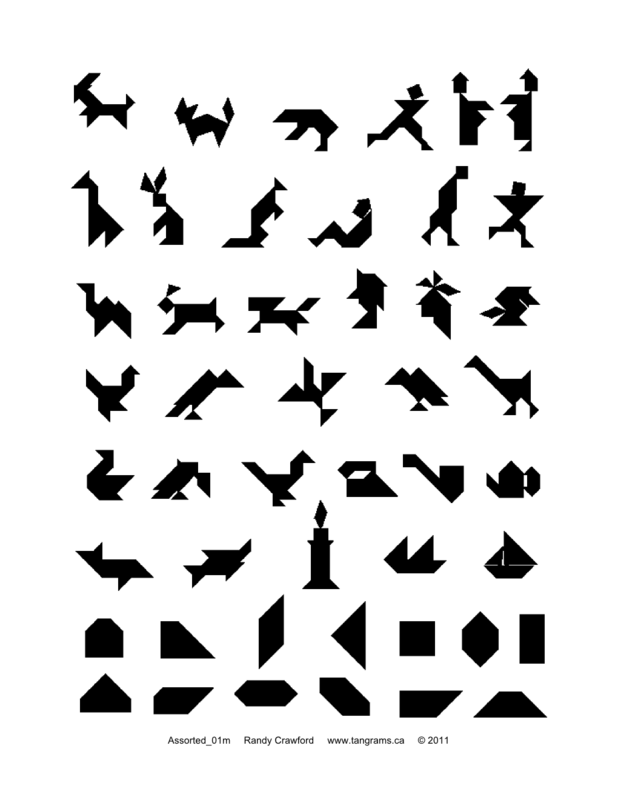 Tangrams are an ancient Chinese Mathematical Puzzle. There are 7 pieces in a Tangram Puzzle (5 triangles and 2 quadrilaterals), and the idea is to make different shapes using ALL SEVEN PIECES. The first task is to make a set of Tangram pieces. This is done by first constructing a square, and then cutting this up into the pieces. You must accurately construct each piece (using compass and ruler) for the puzzles to work. The first activity below shows you how the square needs to be divided into the 7 pieces. Each point that is either a corner of the square, or the midpoint of the two points it is in between. It is possible to make 13 different concave polygons using the Tangram Pieces. One of these is the square, which was how we initially constructed the Tangram Pieces. Use either the pieces you constructed, or the activity below to make the other 12 polygons (to see the polygons, click on the buttons at the bottom of the activity to produce an outline). In the activity, the square is tilted to make the side lengths easier to work with on the grid. Because of this, the outline that appears for a couple of the shapes is also tilted, and if you are making the shapes by hand you may find it easier to make them in their non-tilted orientation. Using the activity, you can either place the pieces inside the outline, or design the shape outside, and place the outline over the top to check. To move a piece grab the blue point. To rotate a piece, use the red point. An art form in China surrounds Tangram Puzzles, and there are many other shapes that can be made using the pieces. Below is an idea of some of the different characters that can be created (but there are many more). How many can you make using your pieces, or using the first activity on this page? Once you have made one, print screen and put it in your book. Tangrams provide a rich environment for exploring shapes. The actual process of creating a set of Tangram Pieces requires students to use Compass and Ruler construction methods, and is a good practise of these skills. The first Activity on this page gives step by step instructions on how to do this. You then have two choices with how you proceed: get students to work using the pieces they have created, and you demonstrate at the front using the activities above; or if students all have access to a computer, have them investigate the shapes themselves using the activitiy. This takes the problem of turning pieces over away, whilst allowing them to fit the shapes into an outline. Extend this by getting them to try to make a non-polygon from the image above (or indeed their own). This provides an excellent resource for creating a display, and one way to do this might be to get your students to first describe in detail using correct mathematical vocabulary how to make the pieces, and then surround this with some of the shapes they make. You could also set the students a homework to make the pieces using this activity, and then explore the shapes in the next lesson. For lots of information about Tangrams, and some beautiful examples of them as art, see the Tangram Website.